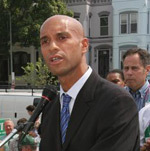 13 September 2007: At 35 Adrian Fenty has become the US capital's youngest ever mayor. Having served as a councilmember until his election as mayor last year, Fenty is also only the second native Washingtonian to be elected to the office. The mayor has already won plaudits for his publicly open and accessible style of governing but other politicians in the capital claim he fails to consult key allies on policy and appointments. Update November 2010: Vincent Gray has been elected Mayor of Washington DC. Update, 15 September 2010: Washington DC Council Chairman Vincent Gray defeats Mayor Fenty in Democratic primary. The mayor was born in the capital and raised in its Mount Pleasant district, an upper working/lower middle class area. Fenty's parents own a shoe store in neighbouring Adam's Morgan, the highly diverse entertainment district. He holds a bachelors in English and Economics from Ohio's Oberlin College and a law degree from the DC's Howard University. While Fenty graduated from Howard, regarded as a traditionally black university, he himself has bi-racial parentage, increasingly common for many young Washingtonians. Though only 35 and describing his rise as unplanned, Fenty has already served his time politically and professionally in Washington. He worked 'on the hill' in the congressional offices of a number of Democratic politicians, including Eleanor Holmes-Norton, the district’s current non-voting Delegate to the House of Representatives. Before serving on the city council, Fenty presided over his local civic association and was elected to one of the capital's 37 Advisory Neighbourhood Commissions (community councils), serving as treasurer. In 2000 he was elected to serve as city council member for Ward 4 among the 12-member city council, being re-elected in 2004. During his stint as a council member he attracted a reputation as a champion for public services, occasionally coming up against the policies of Mayor Anthony Williams’ administration. Politics on both the city council and in its dominant Democratic Party is divisively fraught at the best of times, possibly because of the party's stranglehold on city politics and the absence of a serious Republican challenge locally. The near-perpetual presence of Marion Barry on and around the council, once dubbed ‘mayor for life’, has led to a corrosion of civic values in local institutions and the thwarting of local autonomy by the imposition of a federal control board to run a parallel administration throughout the latter half of the 1990s. There is no shortage of factional backbiting and personality cults in DC’s local politics either. While this may have presented itself as an opportunity for the young Fenty to emerge as a safe pair of hands, though lacking experience, it also points to obstacles for him to overcome in his forming an administration. Fenty will also have to placate or at least negotiate his former city council colleagues, none of whom endorsed his bid for the mayoralty. Fenty announced his bid for the mayoralty in 2005 and came up against an array of challengers in the September 2006 primary vote to select a Democratic candidate. In a city where Democrats out-number Republicans 10-1, the winner of the Democratic primary is effectively guaranteed election in the November general election. Fenty’s principal opponent in the primary was council president Linda Cropp, a longstanding veteran of DC politics who was endorsed by current mayor Anthony A. Williams. In the vote however, Fenty received 57 per cent and won all precincts, being hailed by the influential Washington Post as offering the best blend of energy, nouse and popular support. Though mayor of the nation’s capital and federal district, DC’s city chief tends to be overshadowed by mayors of bigger US cities. However, Fenty follows an interesting array of former mayors, most immediately the technocrat Anthony A. Williams (1999-2007), frequently noted for his signature bow-tie and stiff demeanour. Aside from the unmemorable administration of Sharon Pratt Dixon (nee Kelly) during the interregnum (1991-1995) precipitated by his incarceration for drugs convictions, from 1979-1991 and then from 1995-1999, the DC mayoralty was held by the notorious Marion Barry. Throughout Barry's final term as mayor, a federal Control Board effectively administered the district's affairs in his stead. Barry was elected to serve alongside mayor-elect Fenty as a council member in 2004. Barry's predecessor as mayor, the first following the decision to grant home rule to the district in 1975, was Walter Washington, who also ran the city as its appointed mayor-commissioner from 1967. 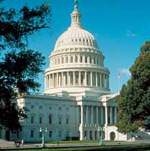 Before this date, the district was governed by boards of commissioners also appointed by the president. Fenty’s wife Michelle, whom he met at law school, is a commercial lawyer and they have young twin sons. Mayor Fenty is a keen runner, even going so far as to encourage residents to join him on his morning run. Michael R. Bloomberg became New York's 108th mayor on 1 January 2002 and was re-elected for a second term on 8 November 2005. He was born into a Jewish-American family on 14 February 1942 in Medford, Massachusetts, where his father was the bookkeeper at a local dairy. After attending Johns Hopkins University to study electrical engineering, where he was a self-financed student, he obtained his MBA from Harvard Business School in 1966. He was then hired by Salomon Brothers to work on Wall Street. He quickly advanced through the ranks and became a partner in 1972. Soon after, he was supervising all of Salomon's stock trading, sales and later, its information systems. He was dismissed in 1981 after another company acquired Salomon. Bloomberg used his stake from the Salomon sale to start his own company, an enterprise that would revolutionise the way Wall Street did business. In 1982, Bloomberg L.P. sold 20 subscriptions to its service; 20 years later that figure had multiplied to over 165,000 subscribers worldwide. As the business proved its viability, the company branched out and in 1990 Bloomberg LP entered the media business, launching a news service, and then radio, television, Internet, and publishing operations.